I have been playing with Col. Whelen’s famous ‘Forester’ Tent design: http://www.theultralighthiker.com/col-townsend-whelens-forester-tent/ I have certainly come to the conclusion that the classic A-frame tent sloping away to the back has seldom been bettered. I reduced some of his dimensions and increased others. We do not need such a tall tent as his, particularly at the rear, nor quite so wide, but we do need a little more overhang at the front as we will want closeable flaps at the front in case of heavy rain. PS: Click on the pictures for a larger view. I am trying (successfully) to overcome these chief problems of store-bought (other) tents: Too heavy. Too hard to put up. Won’t stay up. No standing room. Can’t sit in the rain with the tent open. Can’t be heated by a fire. Can’t cook in them. Too small. Nowhere to put gear. Nowhere for dogs. Poor ventilation. Gear gets wet from condensation. Too hot/too cold. Zips break. No view. Too expensive, by far! This is a good standing height for Della, and fine for me with a bit of a slouch. It has Spot’s ‘seal of approval’. This one should overcome all that and cost no more than $30! You can make it from blue poly tarp material and if you can sew (if you can’t access Tyvek – but I would order a roll from Bunnings if I were you: 10′ x 100′ ie 3m x 30 m < A$200. You will find lots of uses for it). You can cut the main tent (in one piece – then hem) and the front flaps from one 10′ x 12′ (3m x 3.6 m) tarp. You will need another one for the floor and back section, though you might just squeeze the rear out of the first tarp too, in which case you will only need 8′ x 5′ (2.5m x 1.5m) for the second one. Some 2mm spectra/dyneema and some glow-in-the-dark clam cleats eg from here http://www.cleats.co.uk/browse-by-product/line-lok-guy-runners/cl266-mini-line-lokr-for-1-3mm-lines.html at .58 cents ea delivered) and some pegs to tie it out. I would use eg the triangular titanium ones (2-4) for the front and back tie-outs and the orange titanium shepherds hook ones for the sides and flaps (6-8). You will need some 1/2″-3/4″ webbing/grossgrain ribbon for the tie outs. It is better to sew the webbing so the material is captured between its two ends. Reinforce the tie-out points with a sewn in triangular piece of tarp material. Pay particular attention to the end tie-outs. I would double reinforce them and with a larger triangle. Don’t (ever) use grommets! They tear out. You simply tie the two poles to the tent with a couple of clove hitches right up where the tie-out connects to the tent. I have realised that if the front flaps (and the back wall are sewn in under an overhang, a covered ventilation system will result at the tops. At the back (certainly) I will want to be able to close this when there is a very cold wind blowing (Velcro). At the front, probably not. I also realise how easy it will be to have mosquito curtains inside the flaps. They can simply hang down to the floor and overlap each other . When the front flaps are not needed to keep out rain, they can be pegged out to create lots more space (as shown). This prototype has a floor area approx 7’ wide at the front and 4’ at the back. Its inside length is about 6’6”, long enough for us. I have altered Whelen’s dimensions as follows: ridgeline 8’6”- 9’, length of side walls 7’6”, front height of side walls 6’6”, rear height of side walls 2’10”. That is a ‘standard’ 6’ x 4’ (1.8m x 1.2 m) blue poly tarp you see lying in it. 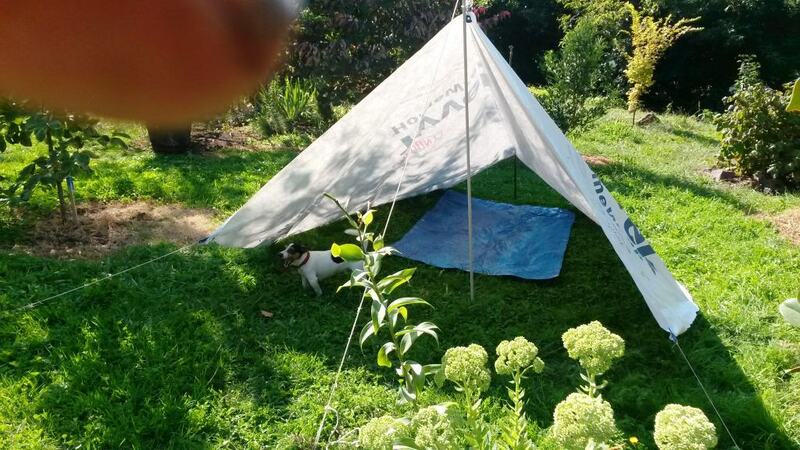 If I make this tent entirely in Tyvek (including a sewn in ‘bathtub’ floor (supported at the front by the walls, the pole and an elastic draw cord), and closeable flaps and sewn in back it will weigh 720 grams (546 in silnylon; cuben with a silnylon floor would be approx 350 grams) without the insect screen which will only add about 50 grams. I am really surprised how light it will be for such a large tent. It is big enough to sleep three people (if they are very good friends) and there is plenty of room still for all their gear at the front. It will be a palace for Della and me – and the two dogs! Most important, you can sit around on your http://www.theultralighthiker.com/cyclone-chair/ in it with a fire out the front even when it is raining, drinking your Bacardi 151 – or your own poison! You can also get dressed standing up! If I sew a fringe about 6” high of insect screen around the edge of the bathtub floor and then sew it to the walls, I will have ventilation all around by simply elevating the whole tent a couple of inches. This could be good on a hot day. The tent can be erected with a pair of hiking poles plus the addition of a short tube of aluminium/carbon fibre to extend one of them – or with sticks you find at camp! 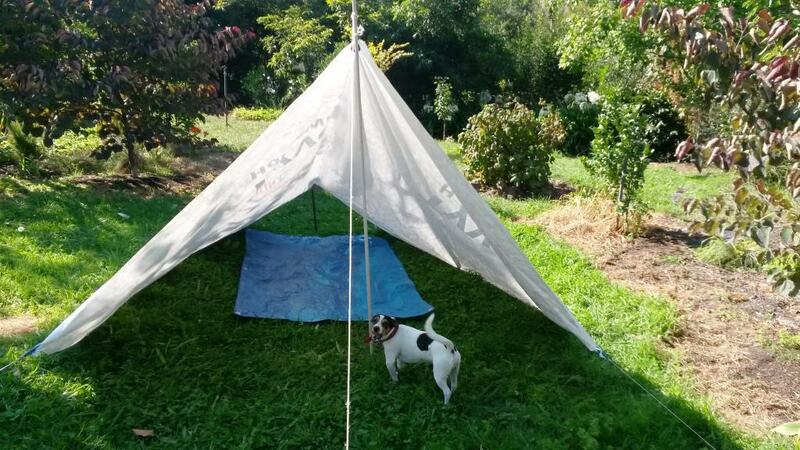 I have just erected the prototype using some tarp clips, so it doesn’t drape as well as it will when sewn. The hems will stiffen it. You could just leave it like this and add the flaps and back end in with Tyvek tape – if you can’t sew. We will ‘finish’ off the prototype (in Tyvek) and try it out some before I settle on a ‘final’ design – which I will then post. I may decide to ‘catenary cut’ the ridgeline for example, almost certainly for the silnylon model – and maybe the sides as well. This one has been sitting in the garden for a few days along with my solo fire tent and with some other bought tents. It has been windy and the bought tents have mostly blown down – whereas mine are still standing fine. I have thought though I may make the rear panel a little higher, maybe 2’6″ instead of 2′- just to make sure it never drapes onto your sleeping bag. Perhaps in the end I will find that Whelen’s dimensions are perfect after all! I know about the finger, but I could not resist the picture of the dog! Some people have asked how you have a fire out the front when the guy is obviously in the way. Well spotted. I was short of string. Usually I use two guys connected to the same pegs I have guyed the front flaps out to, so the fire would be straight out front. 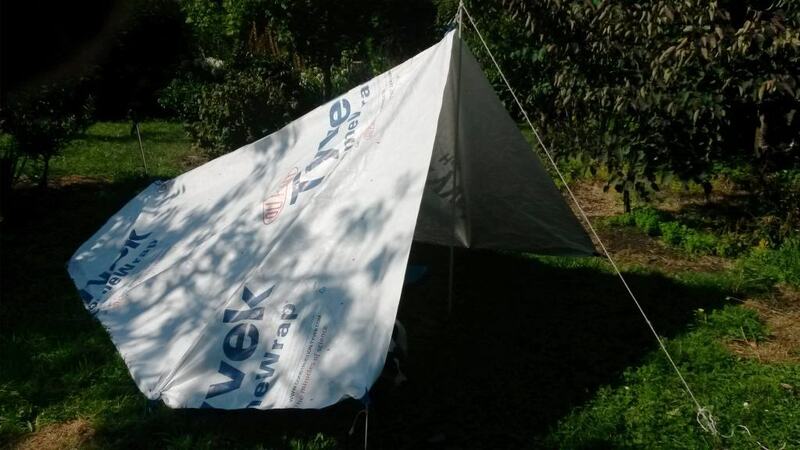 PS: I have also planned some alterations to my http://www.theultralighthiker.com/tyvek-solo-fire-shelter/ I realised I can easily make it big enough for two by adding two small flaps at the front and widening the floor by about 1’. I have also figured a way to create a sort of wrap around ‘umbrella vent’ at the top utilising the two front guys, a piece of Tyvek and some Velcro. I have also worked out a way to half close (at the top) the front door to create the maximum dry space when the door is not completely closed. This is (usually) the most serious drawback of ‘pyramid’ type tents ie that it rains in the middle of them. This mod will stop that. These additions will add only about 50 grams, so it will still be under 650 grams in Tyvek. It will still be even lighter than the above tent – about 450 grams in silnylon; probably under 300 with a cuben fibre roof. Great for solo overnight hunts/trips. I will update the post when I have made them (ie the alterations). Interesting. I have had good luck with tying the corners of Tyvek out using a line tied on with a double sheet bend. (I used cheap 3.5mm polyester 8 strand cord.) Just twist and spindle the corner of the fabric and fold it over to tie the sheet bend. A single sheet bend slips, but a double sheet bend holds. I think it’s stronger than stitching, as there are no holes punched in the fabric with the needle, and the strain is spread throughout the fabric rather than being concentrated on one spot. It only works for corners of course, and it wrinkles the sheet, but it’s strong. The only way it can fail is if the knot slips or if the whole sheet tears in half. I’ve used the same Tyvek sheet as an groundsheet protector for years. Durable stuff. Thank you. If you catch something like this http://www.theultralighthiker.com/worlds-lightest-tarp-clip/ inside your knot it works even better. Folks who don’t sew can also try making a ‘handle’ with Tyvek Tape. Or you can learn to sew (simple) and sew on a reinforcing patch and some grosgrain tie-outs as I do on all my tents – which are a lighter and tidier option. Can’t wait for the finished product !!! Thanks Muzza. I had almost forgottten about this tent mainly because of all my other tent designs – also unfinished. It will be a beauty though. I will come back to it. And i will post the plans when i do. I have plans for the plans! Cheers, Steve.